I’ve been baking bacon for years. I love the technique because you can cook a lot of bacon at once, it doesn’t get your stove totally greasy, and the bacon comes out great. It’s my favorite. But I didn’t realize until last week that there is a small trick I didn’t know about that makes for perfectly baked bacon. So, what’s the big secret? This magical trick? The trick is putting the bacon into the oven when it’s cold. That’s right, do not preheat the oven. 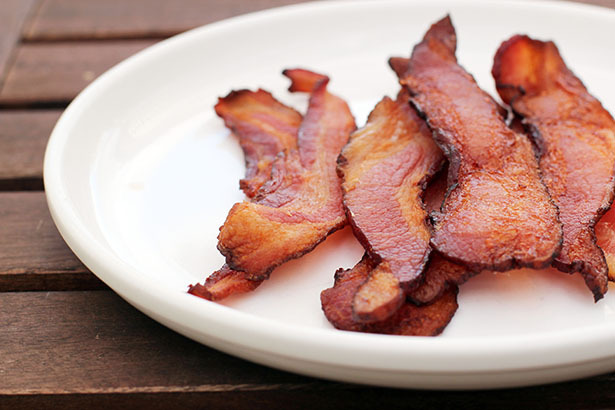 The cold oven allows the bacon to cook slowly, which makes bacon happy. Now, I’ve been putting my bacon into a preheated oven forever and been totally happy, but since I’ve started not preheating the oven, the bacon is just that much better and more evenly cooked. Also, putting the bacon into a preheated oven doesn’t add any time to the preparation. After all, you’re going to be preheating the oven no matter what! I know, an entire blog post about this little tip? Well, that’s how excited I am about it. This discovery is, to me, completely blog post worthy. 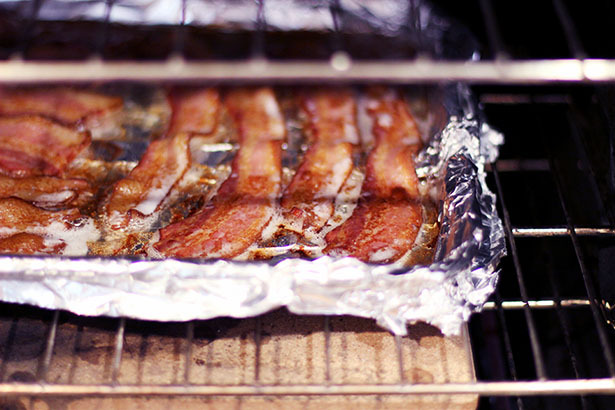 Place baking sheet in oven, then turn oven on to 400º F.
Cooking time will depend on how long it takes your oven to heat as well as how thick your bacon is. My oven takes 25 minutes to get to 400º F, and then our super thick bacon from the local grocery store takes about another 20-30 minutes to finish cooking, so my total cook time is usually around 45 minutes. I would start peeking at the bacon to see how it's doing once the oven is fully heated, and then check in on the bacon every 5-10 minutes. When it's getting close to done, 1-2 minutes can make a big difference in how crispy it is. You'll figure out what works best for your taste after a few times cooking it this way. My other latest trick is to cook the bacon so it is a little bit underdone then storing it in the fridge so we have cooked bacon at our fingertips. To reheat, microwave for 30-90 seconds (depending on your microwave's strength, the thickness of the bacon and how crispy you like it - work in 10-15 second increments to find the magic number) to finish off cooking the bacon and enjoy! I love baked bacon, and had no idea you can put it in before you turn the oven on. Will try that! I do this, but I use parchment rather than foil. The parchment can be composted, which makes me feel a little better about the environmental impact. I have so much environment guilt when I make bacon! the foil AND the paper towels on the plate to soak up grease. It’s a beast. I’ll try the parchment next time! cool, thank you for that rec!